I've never live blogged before. I'm not even sure RSS readers can follow along. Oh well. I've always blogged for myself anyway. If you want to come along for the journey, feel free! 6:40 - Warm up the Ferrari. Now it's getting good. 6:50 am - Oops. Forgot my GPS. 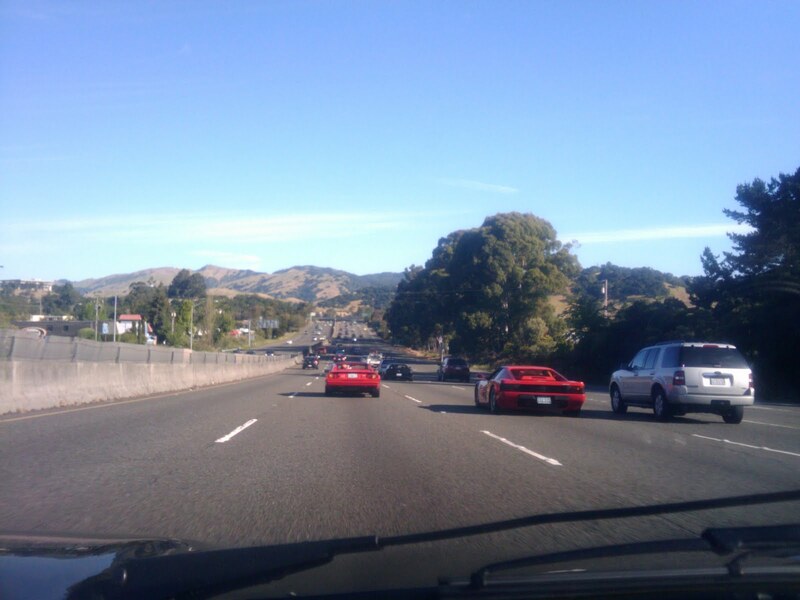 7:00 am - As I merge onto I-280, there is Andrew in his beautiful black Ferrari F355 B. Two black Ferraris are headed north. 7:01 am - What's on the radio? Paint it Black, by the Stones. Includes the line, "I see a line of cars and they're all painted black." I could not make this stuff up. 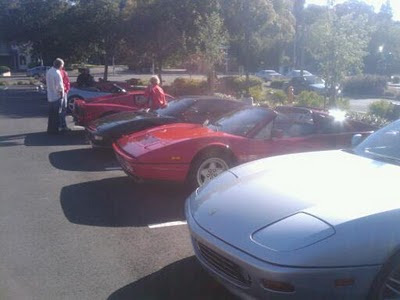 8:00 am - Meet 9 other Ferrari drivers in Marin county. Cars range from an older 308, to another 328, two 348s, two 355s, a 456 and a 360. I'm sure there was one other. 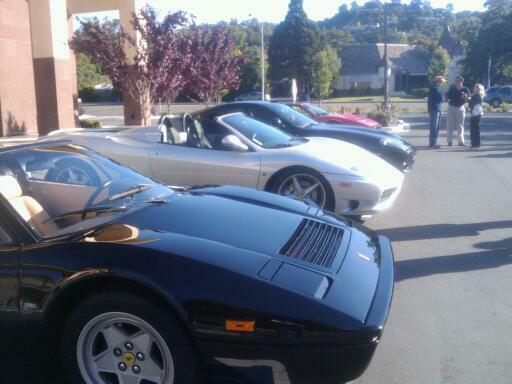 EDIT: There was also a Testarossa and a 550 Maranello. 9:00 am - Meet at a cafe in Larkspur. Great conversation and great food. 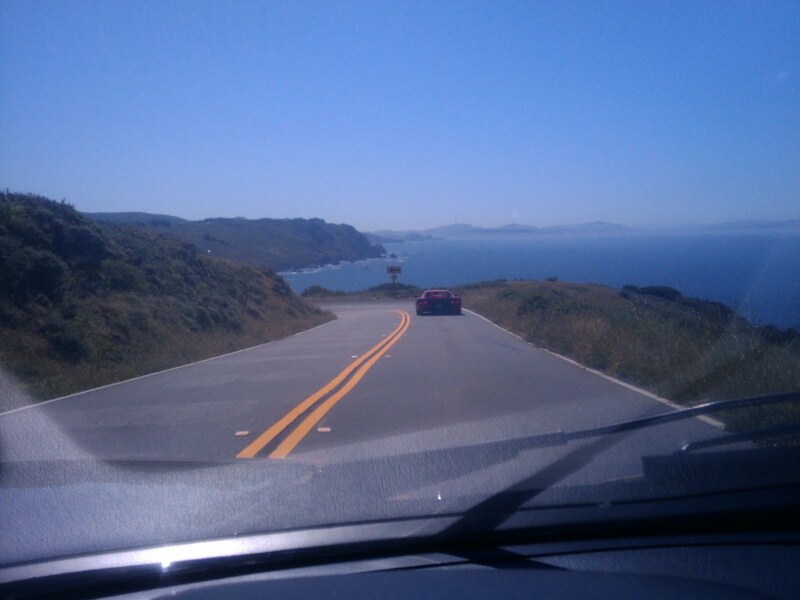 10:30 - 11:30 am - Spirited drive along the coast. 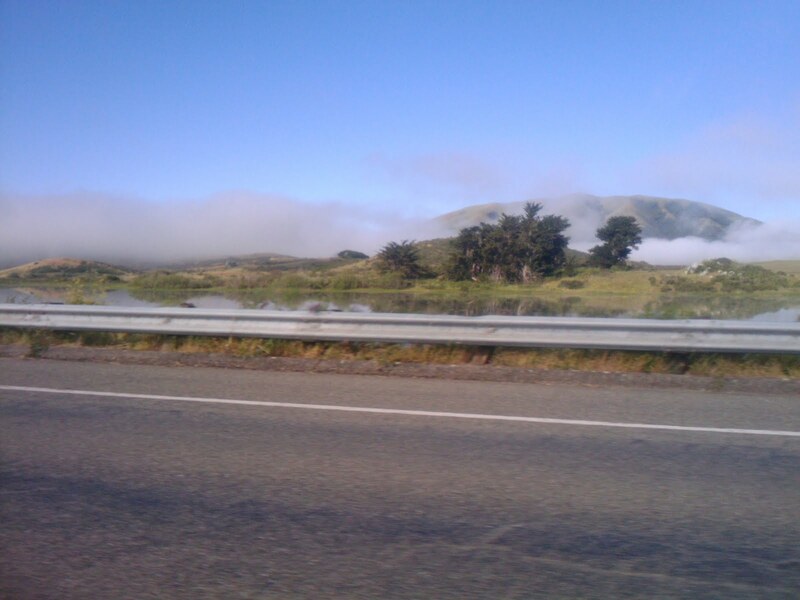 My God, California is beautiful! 11:20 am (approx) - we drive by this lake and there is smoke on the water. What's playing on the radio? Smoke on the Water. I'm dead serious. I have this very real and selfish thought: I can't believe this is my life. Real smoke on real water. 12:00 pm - Back at home now. Picking up The Wife in the Ferrari and headed out to Phase II. 2:30 pm - What should have been a 45 minute trip to Half Moon Bay turned into an hour and a half over Highway 92. Turns out we weren't the only ones who thought about heading out this way on such a lovely weekend. We averaged 12 miles an hour for the 10 miles over the hills, which was painful in the Ferrari. I was a little worried about overheating, but we coasted most of the way down once we crested the peak. 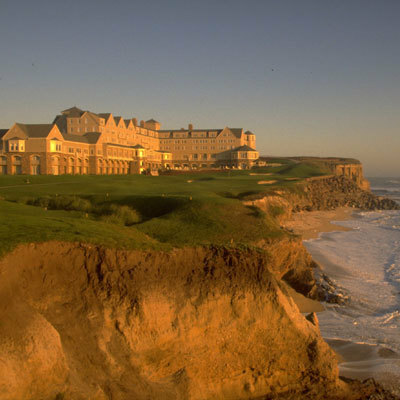 Our drive ended at the incredible Ritz Carlton in Half Moon Bay (thanks Betty!). We got here just in time for The Wife to change and get down to her 80 minute massage appointment. I spent the time in the spa, alternating between the sauna and the steam room, followed by a shower and then some leisurely time sitting in the comfy chair while snacking on mixed nuts and dried fruits. Unfortunately, I hadn't charged my iPod, but I had Sojourn (thanks Drizz!) to keep me company. 7:25 pm - After a leisurely afternoon spent strolling the grounds, taking pictures and snacking like royalty in the Club Lounge, we are off to dinner at Novia. Apparently this restaurant is a Big Deal. I'll let you know. 10:47 pm - Novia was off the hook incredible. We had the tasting menu with the suggested wine pairings. Now we're slightly tipsy and we come back to the room to find our bed covered in rose petals. Which begs the question - what the hell am I doing blogging? Pics to follow tomorrow. EDIT - not THOSE pics. Get your mind out of the gutter. sounds like a nightmare of a day! simply poetry. NOT the ... COMFY CHAIR?!? *giggles quietly to herself, and goes off to make other Spanish Inquisition jokes to her poor unsuspecting husband. Happy anniversary, you two crazy kids! With the pressure of you having to pull up in the premium gas lane, how could the wife be so cavalier as to waste family funds on a massage? That could have gone into a nice savings account! Wow, it's good to be Dr. C....and The Wife for that matter.